The book, written by Julia, was a personal story of her Atlanta row in 2012 to Barbados. An action-packed novel with many details of the journey with her and her team of 4 other women, it was one of those titles more difficult to put down. There was constant action both on and off the water when she also shared her journey prior to the row and the difficulties of her home life. Sometimes I felt it was overworked with those family details, yet the background does give you a perspective on the obstacles she worked to overcome on her voyage. The stand out, too, was that she had learned and gathered some information on human trafficking, and the journey was dedicated to support the cause to end human trafficking. The book touches on some details of the current human slave trade. Correlations were drawn in the book between the slavery of “old” and “new,” and tips included at the back of the book tell you how you can be involved in supporting the cause. Her faith journey, however, is handled in a very subtle way. This is apparently her style, but there are rare references to Jesus and the Christian faith. It just is not her focus so the Christian impact is low. The book would be recommended for non-believers, it just is not strong in that area. I marveled at how the team weathered equipment failure and breakdowns on the ocean; the seasickness and claustrophobia in their cabin; the sharing of their fears; the drawing closer to each other as a team, etc. All five of them were ordinary women who allowed the world to see their struggles as they journeyed through the water. Julia stated, “When life is stripped of everything that doesn’t matter, I can see more clearly.” (138) At the end of Chapter 23, she speaks how she can’t end human trafficking by herself but she can keep rowing and then states, “I can’t do it on my own.” (161) Does she mean the help of her other team members or help from the Lord? It is hard to tell. 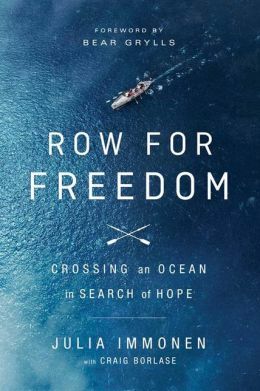 Overall, it was an exciting book touching on both the subject of ocean rowing, which was new to me, but also covering the horrors of human trafficking which is alive and well all across the globe. I just wondered where I was when this journey was complete and why I didn’t hear about it with all the media coverage it got. I figured out that things happening across the globe don’t often garner the attention they deserve from our media. Intended audience would be high school to adult. The sport aspect of it has a broad appeal. There are rare references to Jesus and the Christian faith. It just is not her focus so the Christian impact is low. The book would be recommended for non-believers, it just is not strong in that area.